This year’s participants and activities include Matt Hawkins, acclaimed comic book writer of Think Tank, Symmetry, Aphrodite IX, and more for Top Cow Productions, cosplayers from the West Coast Avengers and Vader’s 501st Legion, a live, in-rink, wrestling demonstration by Supreme Pro Wrestling, face painting, balloon makers, TEDxSacramento speaker and founder of HeroicGirls.com John Marcotte, Drewski’s Gourmet Food Truck, Wandering Boba, shaved ice, Sac City Rollers on skates, promoting roller derby, collage artist Jill Stafford, Mario Estioko who just his first comic panel book, Incompatibles, to name a few. 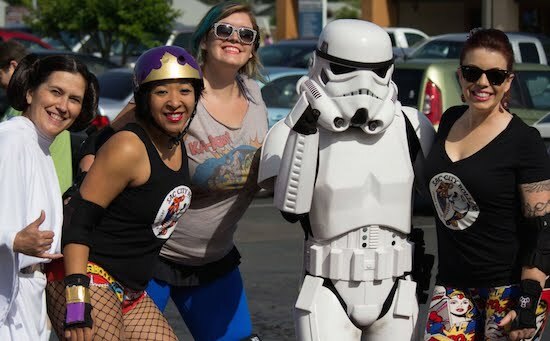 Empire’s Comics Vault has celebrated Free Comic Book Day since the shop's first year of operation in 2003 and, including this year, will have given away more than 100,000 free comic books to customers and other fans in the greater Northern California region. In 2008, Empire’s Comics Vault began inviting local artists, writers, podcasters, and community groups to participate in the event, transforming it into a mini-convention. The full list of exhibitors, community groups and food providers for the Free Comic Book Day Mini-Con may be viewed at EmpiresComics.com. Admission is free. Attendees may take one of each free comic book title that they are interested in reading. There will be 50 different Free Comic Book Day titles available this year, in addition to scores of other select free titles, and a total of more then 20,000 free comic books. For more information about the event, visit www.EmpiresComics.com.